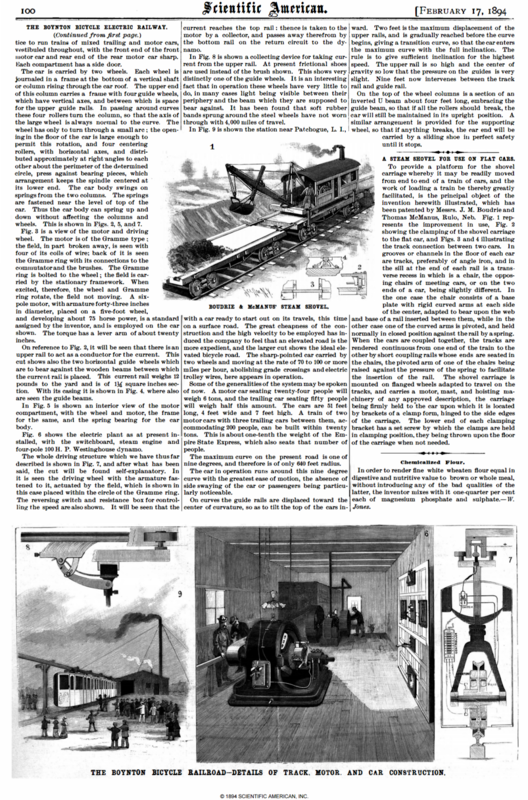 More on that terrible New York Times hyperloop articles -- the "skeptics"
Picking up where we left off on the painfully credulous New York Times Hyperloop story, here are a few passages I want to single out. 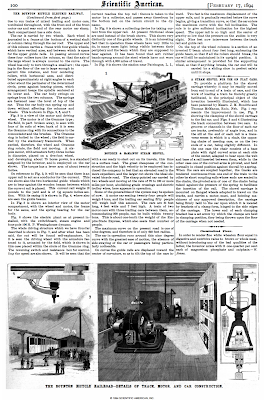 First off, the does-not-violate-the-laws-of-physics standard is an incredibly low bar for an engineering proposal, particularly one that has been floating around in more or less its current form for about a century, but nonetheless it is frequently invoked in these articles. The question is cost (both in terms of construction and maintenance), followed by speed and reliability. The problem Reisman cites is nontrivial (we’re talking millions of cubic feet of near vacuum), but it’s minor compared to the issue of stability, which is itself minor compared to that of manufacturing and assembling a massive structure with this level of precision. Worrying about regulation at this point in the process is like debating what color you’ll paint your mansion when you win the lottery. This perhaps the most unintentionally informative passage in the entire piece. The hyperloop is an example of a major genre of 21st Century tech writing, stories about some long promised technology that is suddenly just around the corner. Fusion reactors, Martian colonies, the end of aging, yes, even flying cars. Remember that. It's going to be important for future discussions. For some reason, it has become obligatory to cite pneumatic trains as precursors of the hyperloop despite the fact that the technology had little connection to Musk's hyperloops and almost none to the "hyperloops" being proposed today (which are actually just maglev vactrains). This late 19th Century system is a much more direct ancestor. 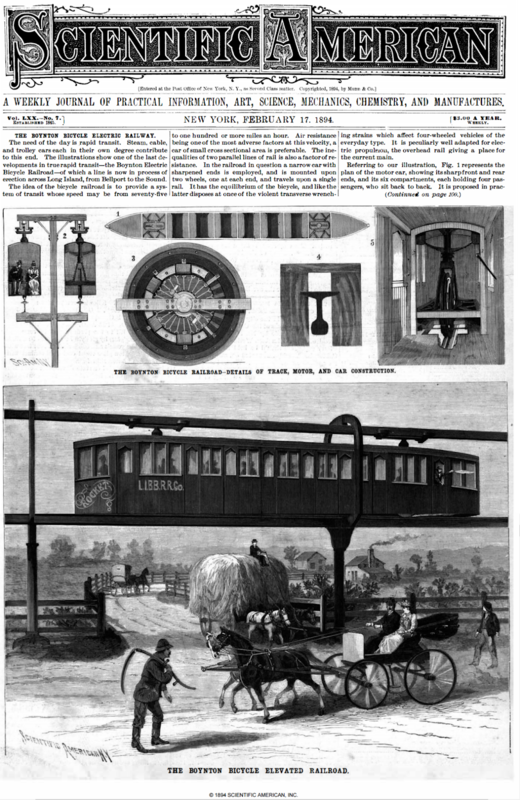 If there's an engineer in the audience, I'd very much like to know what the relationship is between this very cool 1890 system and the history of linear induction trains. The latest piece on the Hyperloop from the New York Times doesn't just take false balance to the next level; it takes it to the level after that. This article by Eric Taub is the kind of multilayered awful that requires multiple passes to address. Just to catch up those who are coming in late, there has never been any question as to whether or not it is possible to build a high-speed maglev vactrain. There are still some nontrivial points to be worked out about reliability and stability, but those pale next to the central challenge of cheaply and quickly constructing then maintaining hundreds of miles of tubes consistently sustaining a near vacuum. Each segment has to be airtight, absolutely uniform (a small irregularity can make a big difference at 600 miles an hour), and each joined with perfect seals. Add to that the cost of the magnetic levitation track and linear induction system and you have a fantastically expensive and time-consuming project. It has become the norm for hyperloop puff pieces to ignore these main challenges in order to breathlessly announce major advances in what invariably amount to trivial side issues, but this piece manages to break new ground. Anyone who has seriously followed the climate change debate over the past 15 or so years will be familiar with the first level of false balance where a minority, even fringe position is given equal standing with the scientific consensus. If you followed the coverage of Mars One, you've seen this taken to the next level where the majority of time is spent credulously recounting the fringe position with the mainstream skeptical view addressed briefly somewhere past the halfway point of the articles. Now, the New York Times takes things even further. No one represents the mainstream consensus. The experts who are presented as "skeptics" are actually true believers brought in to introduce that incredibly tired Silicon Valley line about regulations being the only things holding us back from a technological utopia. We've been through this before and I'm certain we will cover it again, but almost invariably if you hear someone going on about evil regulators holding back the development of a new technology (with the partial exception of medical fields), you can be fairly certain it's an attempt to distract from nonviable tech. Final word from Brad Delong. I had known about John Taylor, but had thought that was a strange one-off. And now Niall Ferguson. Is anybody even pretending to have a business model other than pup-and-dump? This is perhaps the worst hyperloop story I've read in any major newspaper (and that's a highly competitive category). The New York Times' Eric Taub really goes for the gold here. For depth of buried lede alone, he may have set a record. Too much more to list here, but all of our previously stated reminders still hold. "[A] cross between a Concorde and a railgun and an air hockey table"
“[R]educed-pressure tubes in which pressurized capsules ride on an air bearings driven by linear induction motors and air compressors." The idea of air bearings has been around for a long time and has proven useful for a number of applications, but, after a great deal of effort, researchers concluded sometime around the 1970s that it was not workable for high-speed rail. 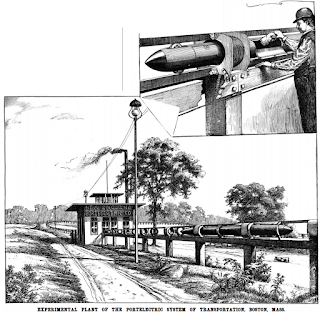 When companies started trying to build even small, very limited working models of the Hyperloop, the first thing that most, possibly all, did was to scrap the one aspect that set Musk's concept apart from more conventional maglev vactrains. This is a small detail but it is enormously telling. They dropped much of the actual idea, but they kept the name and the associated buzz. 2. 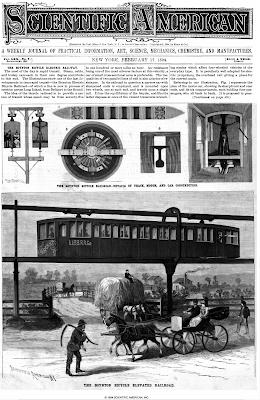 Neither the Hyperlop or the “Hyperloop” offers much new. 3. You didn't see supersonic trains twenty years ago for the same reason you aren't likely to see them in the near future. Whenever people looked seriously at these projects, they concluded that the cost was prohibitive. And no, this didn't have anything to do with land rights or onerous regulations. Even under the best of circumstances, big projects cost a great deal of money, and with maglev vactrains, the conditions are about the worst imaginable. This is supposed to be a brief overview, so I'm not going to make a deep dive here, but I will mention three factors: reliability, safety, and most of all tolerance. You've got people traveling hundreds of miles an hour in a near vacuum. Just to get the damn thing to work, every part has to be manufactured to the tightest possible tolerances, every piece of work has to be done perfectly. But just working is much too low a bar here. With a Hyperloop, even a fairly minor failure can turn catastrophic, causing tens of billions of dollars of infrastructure damage, not to mention loss of life. Those standards of construction and maintenance are tremendously expensive, particularly for a piece of infrastructure that will stretch hundreds of miles. When trying to follow the Hyperloop discussion, it is absolutely essential to distinguish between the easy parts and the hard parts. Many elements of the proposed system are well understood and in some cases widely used already. If you went through the Birmingham Airport in the late 80s or early 90s, you've probably already traveled on a maglev train propelled by linear induction. Other elements are extraordinarily difficult to pull off. For instance, radical new construction techniques will need to be developed to make the system commercially viable. As mentioned before, the combination of extremely high speeds with the need to maintain a near vacuum over hundreds of miles requires a stunning degree of reliability and adherence to incredibly tight tolerances. Every seam has to be literally airtight. You will notice that the "test runs" we have seen from various Hyperloop companies have focused almost entirely on the aspects that don't need testing. 6. So what would a real Hyperloop test look like? We will know that the Hyperloop is actually getting closer when we start seeing demonstrations that address concerns of civil engineers and transportation researchers (specifically those not in the employ of Musk or companies like Hyperloop One). For example, a process or manufacturing tube segments of sufficient quality cheaply or a system for joining these segments quickly and requiring few if any skilled workers. 7. And no, this is not just like SpaceX and Tesla. The long-popular "we should take Musk seriously because he has done impossible things" genre has recently spawned the subgenre "we should take Musk seriously because he's doing the same thing with [Hyperloops/brain chips/giant subterranean slot car tracks] that he did with SpaceX and Tesla" This is simply not true. The approach is almost exactly the opposite. With the latter, Musk proposed plans carefully grounded in sophisticated but entirely conventional technology. With the former, he made vague, underdeveloped suggestions that left experts in the respective fields pulling out their hair. To be clear, Tesla and particularly SpaceX certainly had their doubters, but the skepticism was focused on the business and finance side. Elon Musk unquestionably accomplished some extraordinary things, but he did so by the deviating from conventional wisdom in terms of how you set up companies while staying safely in the mainstream when it came to technology. I was going to come up with some sort of snarky left-handed compliment but I'm tired and my heart is not in it. So I'm just going to come out and say that Reveal is doing excellent work and you should definitely check it out, particularly these stories on the return of redlining. My first job as a statistician was working in the finance industry and, though I have tried to keep up with the field ever since, I learned a great deal from this report including some disturbing aspects of the way credit scores are calculated. Since into the first shutdown (Joseph can back me up on this one), I've been arguing that a declaration of the state of emergency was highly likely. Here was my reasoning. [Let's not quibble about the definition of a voting paradox for now. I'm on a roll.] It has been all the noted that if the stock in a company is held by three people with the first holding 1000 shares, the second holding 1000 shares, and the third holding one share, all three have equal voting power. Any two can get together to form a majority coalition. We can say something similar about a multi player stag hunt. Assuming it takes a dozen hunters to successfully bring down the stag, anyone who controls a big enough group to bring the party under that threshold has the power to end the hunt. This brings up what always should have been obvious problems with the conservative movement strategy. Just to recap, conservative leaders especially in the 60s and 70s came to the conclusion that their policies would never be as popular in the long run as those being advanced by liberals like LBJ. In order to maintain power under these conditions, they came up with a plan that allowed a strong and disciplined minority to maintain a hold on most of the power in the government. The plan always operated on thin margins. In order for this to work, the GOP had to deliver a higher turnout, especially for elections of high strategic importance. At the margins were growing thinner, the conservative movement was also starting to lose control of the social engineering experiment designed to create a motivated and reliable base. The flaw has always been there in plain sight. A Straussian scheme to use the tools of a totalitarian state media – – propaganda and disinformation – – in a subculture of a free and open society will always prove unstable. The wrong messages will start to go to the wrong people and at some point the misinformed cannon fodder will end up holding positions of power in the party. It was the worst possible time for things to fall apart. The threat of diminishing margins is twofold. First, there is an absolute lower bound of viable popularity. When enough of the country opposes you, even the most strategic allocation of resources will not save you. To make matters worse, as you approach this bound, smaller and smaller blocks within the movement gained veto power. Politically speaking, declaring a state of emergency to fund an unpopular project that your administration didn't bother with for the two years you held every branch of government is a bad move, but it might just be the best one open to the Republican Party. What appears to be an increasing and increasingly motivated majority of the country opposes Trump and the GOP agenda. The Republicans' chances of holding anything more than an entrenched court and a few statehouses are very small and dependent on doing two things: slowing these trends and keeping their coalition completely intact. Unfortunately, it is now next to impossible to do both of these things at the same time. Just to have some numbers to play around with, let's say that the Ann Coulter/Rush Limbaugh wing represents 10% of the country which is willing to punish a GOP politician in the primary. Furthermore, let's say that half of them might be persuaded to support a third-party candidate or simply sit out one or more future elections. Given the margins we are talking about, even that 5% would be a devastating loss. We have a similar situation with the cult of personality followers of the president. If the Republicans try to use Trump as wolfmeat, the resulting rebellion of some of those followers will almost certainly enough to push the party deeply into the danger zone. Under these circumstances, the worst thing that could happen would be to force every Republican member of Congress to cast a vote on the record either for opening the government or for standing firm until the wall was funded. As unpopular as the state of emergency is, it passes the bomb to the courts where the electoral consequences are less immediate and there is a chance it can be diffused. Of course, there's always the possibility that the declaration will further anger the majority of the country while failing to placate the Coulter/Limbaugh faction. That would be ugly. 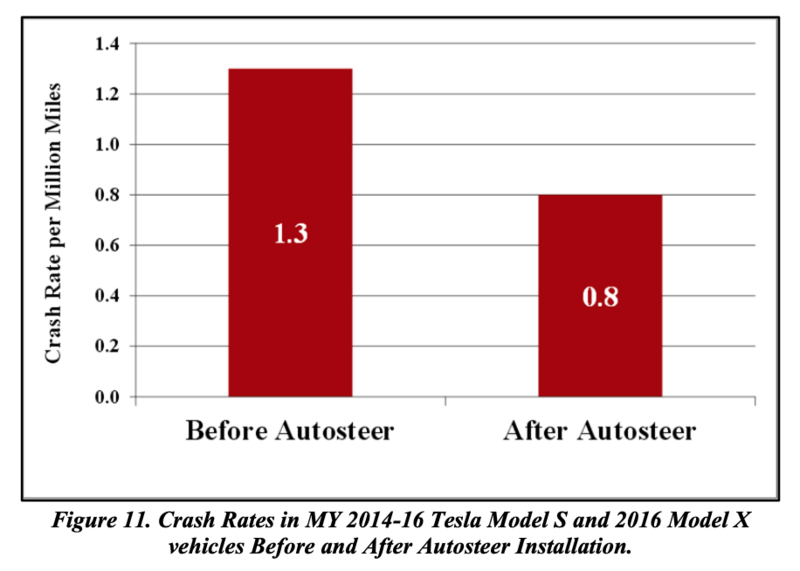 Following up on our 2016 thread, Timothy B. Lee has a great piece up at Ars Technica on how the National Highway Traffic Safety Administration screwed up its analysis of the safety record of Tesla's badly named Autopilot. The mistakes are really embarrassing but perhaps the most disturbing part is the way that the NHTSA kowtowed to the very company it was supposed to be investigating. To compute a crash rate, you take the number of crashes and divide it by the number of miles traveled. NHTSA did this calculation twice—once for miles traveled before the Autosteer upgrade, and again for miles traveled afterward. NHTSA found that crashes were more common before Autosteer, and the rate dropped by 40 percent once the technology was activated. In a calculation like this, it's important for the numerator and denominator to be drawn from the same set of data points. If the miles from a particular car aren't in the denominator, then crashes for that same car can't be in the numerator—otherwise the results are meaningless. Yet according to QCS, that's exactly what NHTSA did. Tesla provided NHTSA with data on 43,781 vehicles, but 29,051 of these vehicles were missing data fields necessary to calculate how many miles these vehicles drove prior to the activation of Autosteer. NHTSA handled this by counting these cars as driving zero pre-Autosteer miles. Yet NHTSA counted these same vehicles as having 18 pre-Autosteer crashes—more than 20 percent of the 86 total pre-Autosteer crashes in the data set. The result was to significantly overstate Tesla's pre-Autosteer crash rate. It's only possible to compute accurate crash rates for vehicles that have complete data and no gap between the pre-Autosteer and post-Autosteer odometer readings. Tesla's data set only included 5,714 vehicles like that. When QCS director Randy Whitfield ran the numbers for these vehicles, he found that the rate of crashes per mile increased by 59 percent after Tesla enabled the Autosteer technology. So does that mean that Autosteer actually makes crashes 59 percent more likely? Probably not. Those 5,714 vehicles represent only a small portion of Tesla's fleet, and there's no way to know if they're representative. And that's the point: it's reckless to try to draw conclusions from such flawed data. NHTSA should have either asked Tesla for more data or left that calculation out of its report entirely. The misinformation in NHTSA's report could have been corrected much more quickly if NHTSA had chosen to be transparent about its data and methodology. QCS filed a Freedom of Information Act request for the data and methodology underlying NHTSA's conclusions in February 2017, about a month after the report was published. If NHTSA had supplied the information promptly, the problems with NHTSA's calculations would likely have been identified quickly. Tesla would not have been able to continue citing them more than a year after they were published. Instead, NHTSA fought QCS' FOIA request after Tesla indicated that the data was confidential and would cause Tesla competitive harm if it was released. QCS sued the agency in July 2017. In September 2018, a federal judge rejected most of NHTSA's arguments, clearing the way for NHTSA to release the information to QCS late last year. The best line to date on the Bezos/National Enquirer story. But Brexiters have created a hermetically sealed logic. Every warning is dismissed as Project Fear, with the jeer ‘you can’t prove Brexit will make that happen’; every time a warning comes true, it is dismissed as Project Fear Mark 2, with the jeer ‘you can’t prove it was Brexit made that happen’. One problem in causation is that few things happen for one reason. A company chooses to locate (or re-locate) for a host of reasons. That doesn't mean that one cause may not be important, or even sufficient. It just means that complex policy outcomes are hard to prove on a case by case basis. So instead you look at frequency and patterns. If homelessness is increasing as policy changes occur then maybe that is a bad thing? If a firm relocates business to Ireland, could it be that it was planning to do so anyway? Of course. But financial uncertainty might make the vehicle more popular and so the timing may well be linked to a policy change. Of course, all of these associations may be confounded and many (if not all of them) will have other causes that contribute. Look at dating -- how rare is it that one attribute in a partner is the only consideration in a relationship. But that doesn't mean that a particular trait (say intelligence or charm) isn't doing a lot of heavy lifting. It is a tough area for inference but we should look at rates and tendencies. If the death rate is going up among younger age groups it doesn't mean opioids or bad traffic regulations are to blame for all of this change, but it is worth understanding there is likely a probabilistic factor underlying the policy change and outcome. With all due respect to Jay Rosen, Margaret Sullivan is the best journalism critic working today. That’s ridiculous, of course, though it seems comforting. If everybody’s mad, it may just mean you’re getting everything wrong. But it’s the kind of muddled thinking that feels right to media people who practice what I’ll call the middle-lane approach to journalism — the smarmy centrism that often benefits nobody, but promises that you won’t offend anyone. Who is the media’s middle-lane approach actually good for? Starbucks founder Howard Schultz won big when he got a super-cushy red carpet for his possible 2020 presidential run as a “fiscally conservative, socially liberal” candidate who thinks his centrism can knit up the nation’s torn fabric. He got this despite his lack of political experience. The Schultz rollout started Sunday evening on perhaps TV’s most prestigious platform — the “60 Minutes” interview — and picked up speed from there. There were naysayers, of course, but the up-by-his-bootstraps billionaire couldn’t complain about the exposure; he became a household name in two days flat. Former Ohio governor John Kasich, a moderate Republican, benefited this week, too, when he joined CNN as a “senior political commentator.” The cable network’s announcement called the appointment “notable” because he is one of the most prominent critics of President Trump within the Republican Party. The idea that cable news is lacking commentary from anti-Trump Republicans is notable only in its lack of self-awareness. And there’s more: Jeff Flake, the ineffectual — but square-jawed — former Republican senator, who was the occasional darling of the Trump resistance, benefited when he signed on with CBS as a contributor this week. It’s safe. It will never cause a consumer boycott. It feels fair without really being fair. We have hit this idea in passing a few times in the past (particularly when discussing the Ponzi threshold), but I don't believe we've ever done a post on it. While there's nothing especially radical about the idea (it shows up in discussions of risk fairly frequently), it is different enough to require a conscious shift in thinking and, under certain circumstances, it can have radically different implications. Most of the time, we tend to think of rational behavior in terms of optimizing expected values, but it is sometimes useful to think in terms of maximizing the probability of being above or below a certain threshold. Consider the somewhat overly dramatic example of a man told that he will be killed by a loan shark if he doesn't have $5000 by the end of the day. In this case, putting all of his money on a long shot at the track might well be his most rational option. You can almost certainly think of less extreme cases where you have used the same approach, trying to figure out the best way to ensure you had at least a certain amount of money in your checking account or had set aside enough for a mortgage payment. Often, these two ways of thinking about rational behavior are interchangeable, but not always. Our degenerate gambler is one example, and I've previously argued that overvalued companies like Uber or Netflix are another, the one I've been thinking about a lot recently is the Republican Party and its relationship with Trump. In 2016, the Republican Party had put itself in the strange position of having what should have been their most reliable core voters fanatically loyal to someone completely indifferent to the interests of the party, someone who was capable of and temperamentally inclined to bringing the whole damn building down it forced out. Since then, I would argue that the best way of understanding the choices of those Republicans not deep in the cult of personality is to think of them optimizing against a shifting threshold. Trump's 2016 victory was only possible because a number of things lined up exactly right, many of which were dependent on the complacency of Democratic voters, the press, and the political establishment. Repeating this victory in 2020 without the advantage of surprise would require Trump to have exceeded expectations and started to win over non-supporters. Even early in 2017, this seemed unlikely, so most establishment Republicans started optimizing for a soft landing, hoping to hold the house in 2018 while minimizing the damage from 2020. They did everything they could to delay investigations into Trump scandals, attempted to surround him with "grown-ups," and presented a unified front while taking advantage of what was likely to be there last time at the trough for a while. Even shortly before the midterms, it became apparent that a soft landing was unlikely and the threshold shifted to hard landing. The idea of expanding on the Trump base was largely abandoned as were any attempts to restrain the president. The objective now was to maintain enough of a foundation to rebuild up on after things collapsed. With recent events, particularly the shutdown, the threshold shifted again to party viability. Arguably the primary stated objective of the conservative movement has always been finding a way to maintain control in a democracy while promoting unpopular positions. This inevitably results in running on thinner and thinner margins. The current configuration of the movement has to make every vote count. This gives any significant faction of the base the power to cost the party any or all elections for the foreseeable future. It is not at all clear how the GOP would fill the hole left by a defection of the anti-immigrant wing or of those voters who are personally committed to Trump regardless of policy. Having these two groups suddenly and unexpectedly at odds with each other (they had long appeared inseparable) is tremendously worrisome for Republicans, but even a unified base can't compensate for sufficiently unpopular policies. Another shutdown or the declaration of a state of emergency both appear to have the potential to damage the party's prospects not just in 2020 but in the following midterms and perhaps even 2024. So far, the changes in optimal strategy associated with the shifting thresholds have been fairly subtle, but if the threshold drops below party viability, things get very different very quickly. We could and probably should frame this in terms of stag hunts and Nash equilibria but you don't need to know anything about game theory to understand that when a substantial number of people in and around the Republican Party establishment stop acting under the assumption that there will continue to be a Republican Party, then almost every other assumption we make about the way the party functions goes out the window. Just to be clear, I'm not making predictions about what the chaos will look like; I'm saying you can't make predictions about it. A year from now we are likely to be in completely uncharted water and any pundit or analyst who makes confident data-based pronouncements about what will or won't happen is likely to lose a great deal of credibility. Howard Schultz is exploiting vulnerabilities in the system we've been pointing out for a long time. God knows we've been over this before (I'm getting a little sick of it myself) but Howard Schultz, a man with no relevant experience whose answers to interview questions consists entirely of word salad garnished with bromides) has garnered the amount of serious attention for a laughable run for the presidency because of longstandiing problems with American journalism. First, Schultz belongs to one of those groups that is always given extensive and respectful coverage. They include the super rich, Silicon Valley visionaries, economists, celebrities, and frequently ivy league professors resting on their laurels. Second, he is promoting one of those ideas that have been granted exemption from balance. Though it seems to be receding a bit, many journalists still have an absolute fetish for giving equal time to both sides of the story even when, as in the case with global warming, there really is only one side. Despite this, certain issues have been allowed presented as axiomatic, without giving any room to opposing opinions. For a while, the education reform movement enjoyed this status, but the best example remains that brand of Simpson-Bowles fiscal austerity that is inevitably depicted as the grown up view despite of mountains of conflicting economic evidence. Third, the Schultz campaign dovetails nicely plays into certain standard narratives extremely popular with a large part of the punditry. The villains of these stories are the extremists in both parties who live simply to make trouble. The heroes are the moderates on both sides who want to push past partisanship so they can role up their sleeves and get things done, and the Holy Grail the successful third party/independent. It is no coincidence that the few hacks like Matt Bai and Dylan Byer who have rushed in to defend Schultz are the ones most deeply invested in things journalistic sinkholes like radical centricism and old-style horse race coverage.